While getting vaccinated, a child (ironically enough!) wears an adhesive bandage from the Disney company. Eighty-five percent of the 121 people in the current measles outbreak have been "traced to Disneyland in California. Thinking about measles vaccine? Then join the club. In 2014, the United States endured the biggest epidemic since 2000, with 644 cases in 27 states. That may seem small, but measles can spread fast by contact or through the air -- and in vulnerable people it can cause pneumonia and brain swelling. In the 20th century, in the United States, two to three people died among every 1,000 reported cases. We've been hearing a lot about decliners; people who refuse vaccine on moral, religious or "personal" grounds. In short, they abhor vaccine more than they fear measles. Some observers, especially in the public health business, denounce these refuseniks as science deniers, and so we decided to look into concerns about genetically modified (GM) food, another prominent example of what many decry as the denial of science. Vaccines prime the immune system to defeat a virus or bacteria it has not yet "met." The practice of injecting disease-causing microbes for this purpose started in 1796 with Edward Jenner's smallpox vaccine. 2014 saw the biggest epidemic of measles cases, predominantly among unvaccinated children, since the U.S. was declared measles-free in 2000. "Measles-free" meant that all cases were traced to travelers from other countries. Relative risk: Is it more dangerous to get vaccinated, or to refuse? If we refuse, do we endanger others? Perceived risk: Do I think it's more dangerous to get vaccinated, or to refuse? As vaccination became more common, so did opposition. In the late 1800s and early 1900s, groups like the Anti-Vaccination League of America and the American Medical Liberty League led opposition to the practice. But the tables had turned by the 1950s, when Jonas Salk became a national hero for producing the first effective vaccine for the crippling and often fatal virus polio. Vaccines were heralded as the most efficient medicine of all, and school districts began requiring shots for students. Measles can be prevented with the MMR (measles, mumps and rubella) vaccine. 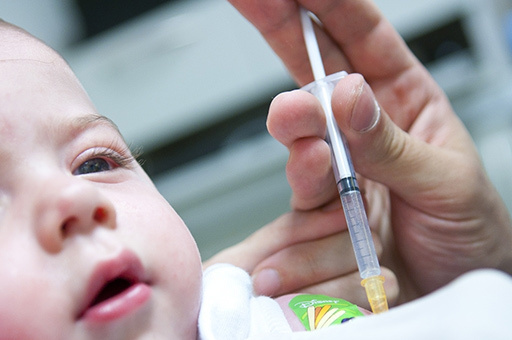 MMR vaccine is administered in a two parts; the first dose provides 93 percent immunity, the second dose ups that to 97 percent. Children are the most vulnerable, so all children should receive both doses; the first at 12 to 15 months, the second between four to six years. Symptoms in teenagers and adults are typically more severe than in children. College students, international travelers and healthcare workers are particularly exposed, so both doses are recommended, spaced at least 28 days apart. Yet as polio, and then measles, mumps, and rubella (German measles) abated, the public awareness of the rationale for vaccines faded. The opposition to vaccines took a quantum leap in 1998, after a study published in The Lancet linked MMR vaccine to autism and inflammatory bowel disease. That study not only fed opposition to vaccination, but also supplied a badly needed explanation for the rising U.S. autism epidemic. 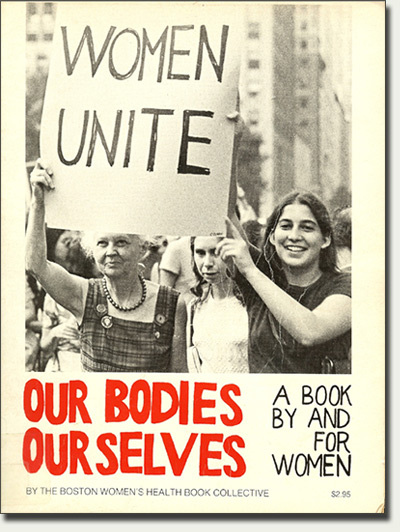 Our Bodies, Ourselves (1971) was influential in the rise of "second-wave feminism," which held that women should be informed and in control of their health care. No longer did "the doctor know best." This skeptical attitude induced questions about many standard medical practices, including vaccines, according to Elena Conis, a historian at Emory University.1. Libertarian attitudes and belief in alternative medicine both fed the questioning and rejection. But the whole study was a morass of bunk. Twelve years later, a tribunal of the British General Medical Council "judged that study author Andrew Wakefield had acted "dishonestly and irresponsibly," in his research. The Lancet retracted the paper and Wakefield was stripped of his medical license. But by then, the vaccine-resistance Wakefield fueled had become entrenched, even though the mercury preservative that was the supposed cause of autism "has been removed from or reduced to trace amounts in all vaccines routinely recommended for children 6 years of age and younger, with the exception of inactivated influenza vaccine," according to the Food and Drug Administration. Still, the autism epidemic continues, and parents who are desperate to understand the cause can be persuaded by circumstantial evidence for the discredited link with vaccines. When, by chance, autism symptoms appear after an inoculation, "that experiential thing is incredibly compelling," says Sharon Dunwoody, a professor of science journalism at the University of Wisconsin-Madison. "We notice when things co-occur, but we never notice when they don't. We are totally oblivious to the hundreds of thousands, or millions of kids who get vaccinated and nothing happens. Everything has to have a reason, and one way of determining causality is looking at proximity." The autism "connection" is an extreme example of the importance of context to these controversies. "I have not seen a study on this, but if you are in a community of people who are parents of autistic children, it's a lot harder for you to come to a decision that is different from that of the people around you," says Bruce Lewenstein, in the departments of science and technology studies, and communication, at Cornell University. "If you live in a community of faith," Lewenstein continues, "it's extremely important for you to fit into the community, which makes it a lot harder to come to personal decisions that are different than people around you. This not anti-science, it's who we are as humans." Evincing another form of faith, like-minded Californians who emphasize "natural living" have been the epicenter of resistance to the measles vaccine. A history of good health is a factor in vaccine resistance: Young people, who have no memory of past epidemics, have greater rejection of vaccines. A 2015 poll asked Americans if the measles, mumps, rubella vaccine is safe for healthy children. A second context is medical: most patients survive measles unscathed, unlike polio and smallpox. "I think there's an acknowledgement that the public is not stupid; they do not put all infectious diseases in the same basket," says Dominque Brossard, a professor of life sciences and risk communication at UW-Madison. "Why would somebody be convinced that they need a vaccine for a disease that they don't see around, and if they do see it and it's not [usually] deadly, why would you have to inject some unnatural chemical?" The "doctor-knows-best" attitude that came under questioning 40 years ago can backfire, Brossard says. "Instead of saying, 'We medical authorities believe you should get your children vaccinated,'" a better approach would stress the benefit of measles vaccination in protecting vulnerable people. 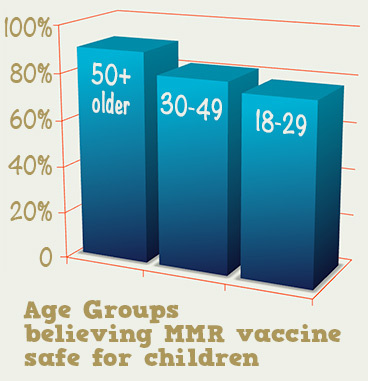 Infants before 12 months, and people with compromised immune systems, cannot get the MMR shot. "Measles is not dangerous for most people, but is dangerous for those of us who have very weak immune systems," Brossard says. "By collectively getting immunized, we are protecting the weak among us. That was the goal, but that was not how it was presented." That's "herd immunity": when a higher percentage of people are vaccinated, there is less chance that those who cannot be vaccinated will be infected. "It's one thing to say about an adult, 'He got measles because he refused to get vaccinated,'" says Dunwoody. "It's another to say a three-month infant in a hospital is somehow responsible for the outcome." Autism diagnoses have skyrocketed in recent decades (left). How much of a role in the autism epidemic do changes in criteria and surveillance contribute? 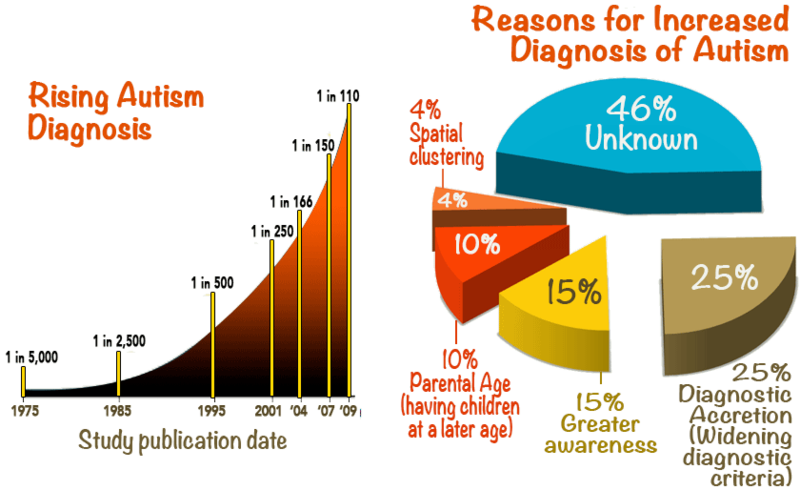 A 2011 feature story found that better awareness and shifting diagnostic criteria explained 40 percent of the increase (right), and another 10 percent might be attributed to older age of conception. That leaves almost half of the increase to be explained. Is Autism on the Rise? 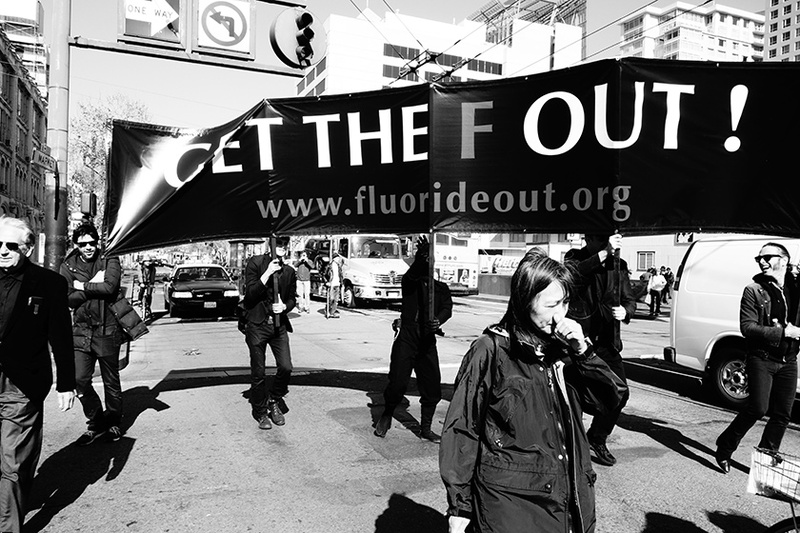 March against fluoride in water in San Francisco. Fluoride, a chemical element known to prevent tooth decay, has been added to public water supplies since the early 1940s to improve dental health. According to the CDC, 74 percent of Americans have access to fluoridated water. Of the largest 30 U.S. cities, only Portland, Ore. does not treat water with fluoride. Opponents of fluoridation question the safety of the fluoride levels permitted by the EPA, and call the practice an unethical mass-medication. The CDC website, however, places fluoridation among the top 10 public health measures of the 20th century. The debate continues, with few controlled studies pushing the argument either way. But as fluoride becomes increasingly available in other sources -- fluoridated toothpaste was developed in 1955 -- public support for fluoridation may be losing steam. 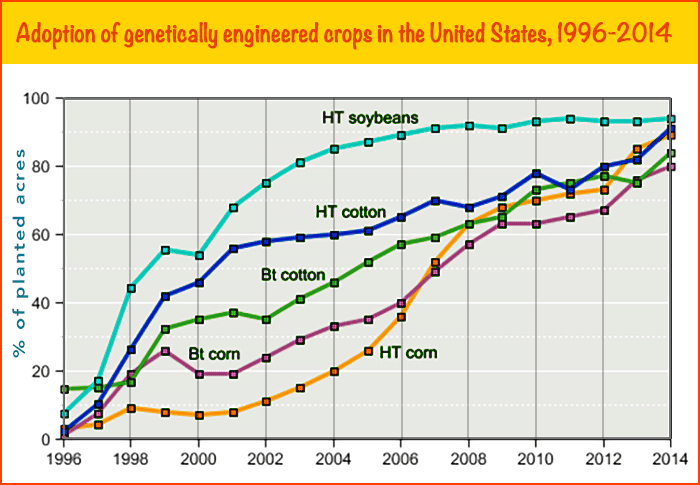 Genetically modified crops, introduced in the 1990s, contain genes transferred from other species. Some GM crops create their own insecticide, reducing or eliminating the need for farmers to spray. Others resist a certain herbicide, allowing blanket weed-killer sprays that spare the crop. Or they may do both. Aided by powerful marketing campaigns and farmer acceptance, GM corn and soybean have advanced rapidly. In 2013, GM crops, also including cotton and rapeseed, were planted on 435 million acres (174 million hectares) worldwide. 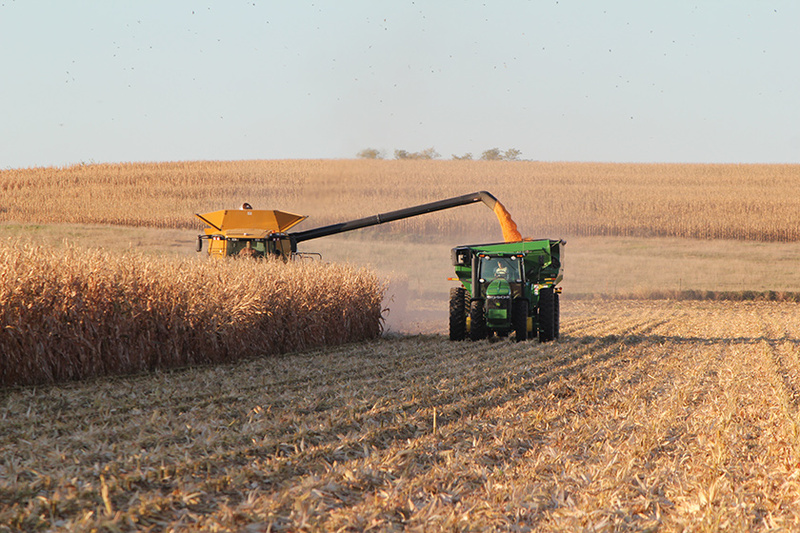 This combine could be harvesting GM corn in Nebraska. Do those imported genes improve yield and profits while reducing insecticide use? Or do they increase monopoly control of agriculture and harm those who eat products made from this corn? The transferred genes may infect other crops, crop relatives, or weeds, with unforeseen consequences. GM crops contribute to the large size and capital intensity of American agriculture, which conflicts in some minds, with the "small-is-beautiful" esthetic of the organic farm and food movement. 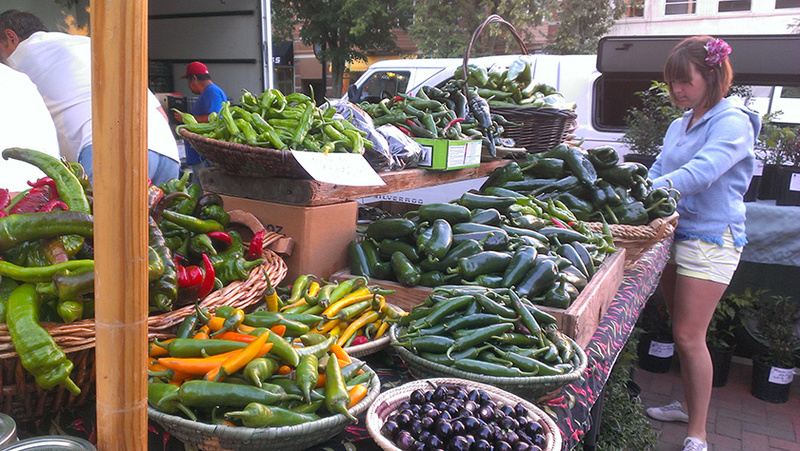 The successful farmers market in Madison, Wis., is an outlet for the small-scale farms that, some say, are threatened by GM crops sold by giant seed and chemical companies. The result, says Paul Thompson, a philosopher who studies food systems at Michigan State University, is "a climate of controversy… and people, perhaps reasonably, tend to view controversy as evidence of risk." The GM issue produced the largest contrast between the opinions of scientists and others. In a 2015 poll2, 88 percent of scientists believed foods with genes introduced from other species are safe to eat, compared to only 37 percent of the American public. HT=herbicide-tolerant, Bt=Bacillus thuringiensis (insecticide-producing). Taking into consideration the Bt and/or HT traits, GM corn accounts for 93 percent, and GM soybean 94 percent of acreage. Europe has been a focus of resistance to GM products, where they were memorably branded "frankenfoods." "In France, the precautionary principle acts to keep things from people until they can be proven safe," says Brossard. "There is a strong rejection of processed food. The country is really close to its food system. If you buy cheese, you know exactly where it came from. In the United States, until recently, people have been less concerned with where the food was produced, and most people are not aware that almost everything they eat contains GM ingredients." Timing may have played a role in European resistance, says Thompson. In the 1990s, when GM crops were introduced, "there were some obvious failures in food safety in Europe, mad cow disease being the most significant." So when the crops were promoted in Europe as having passed U.S. standards, that reassurance could sound hollow. Although fear of GM foods has been characterized as denial of science, "that almost exclusively comes from people who are agricultural scientists," says Thompson. "It's not really distrust of science, it's a distrust of the food industry, but I don't equate that as science. "There is a tendency on the part of the scientific community to think, 'If people just know the science, everything would be better,'" Thompson says. "This misses the fact that in a lot of controversies, decisions that involve science are not just about science. In vaccines, what is driving a significant part is that people whose children are sick [with autism], are desperate for some kind of explanation, and this ends up shaping how a lot of them respond." Ironically, Thompson says that well-intentioned skepticism about some scientific issues (as opposed to denials based on economics or politics) "should not be thought of as anti-science. The public is learning to be skeptical in a way that science teaches its practitioners to be skeptical. In the long view, the public has a more scientific mindset, but ironically, it often gets turned onto science authorities." "Golden rice," containing transferred genes that make vitamin A, is one proposed solution to the "hidden hunger" of vitamin A deficiency, which affects as many as 2 billion people, most of them poor. 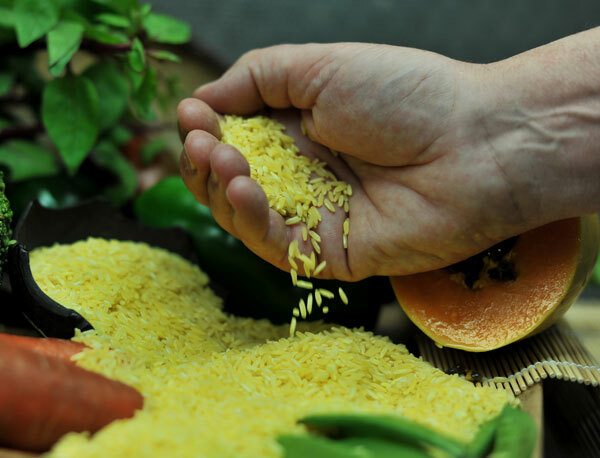 Opponents have tried to block adoption by claiming that golden rice will not solve the entire vitamin-A problem, and that the transferred genes will contaminate other rice varieties. Politics, as always, lurks behind many of these issues. In their rejection of vaccine mandates, "natural-living" types, who gravitate leftward, are allied with libertarians, who tend rightward. In the GM crop debate, skeptics on the left dominate, while conservatives dominate the denial of climate change. An upcoming study in The Annals of the American Academy of Political and Social Science asked what 1,500 people knew about science and then focusing on topics that were debated or rejected by one side of the political aisle, such as nuclear power (liberals) or climate change (conservatives). The bias against science showed up on both sides, but the "conservatives' negative reactions to the scientific pages that challenged their views [on climate change] were four times greater than those of the liberals," wrote Carolyn Gregoire in Huffington Post. 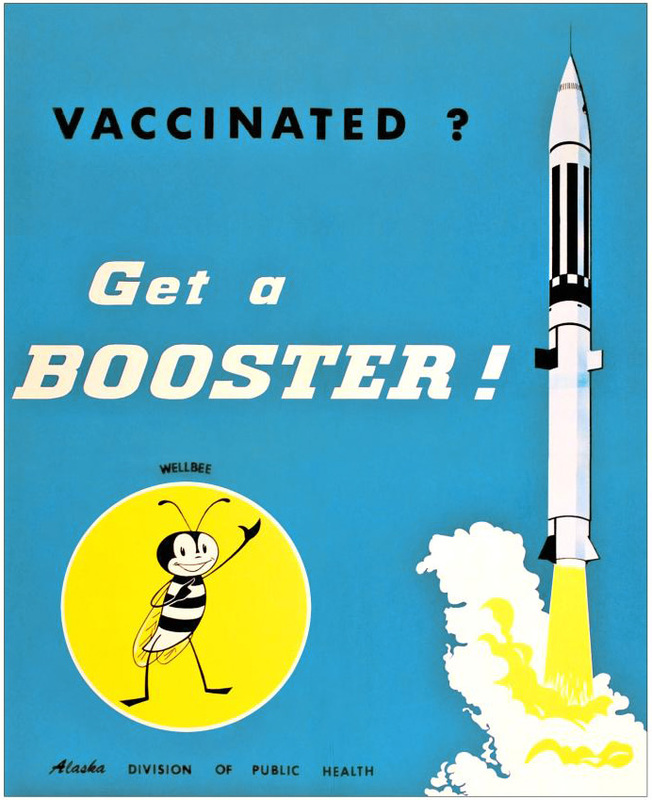 The dispute over vaccination reflects a creative tension in American history, says Lewenstein. "There are very deep, philosophical divisions in our society about who holds authority. Part of the founding genius of the United States is our creative tension between collective and individual rights. We have banded together, but at the same time, part of the principle that holds us together is a fairly strong belief in individual rights. One way that comes out is who gets to tell me what to do." Finally, there is a psychological dimension to these disputes. The passionate people who drive the public agenda "are so committed to their causal explanation, that nothing can change that, even if you confront them with evidence that they are wrong," says Dunwoody. "They can't afford to be wrong, and will figure out a way to devalue the information you provide. Once an issue gets this visible, this vivid, this polarized, you have a subset of people who simply will not change."